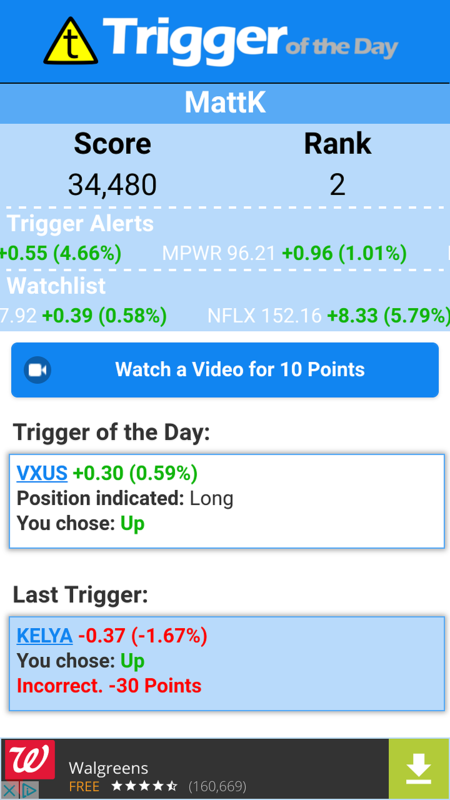 Every trading day our algorithm will produce a new stock Trigger of the Day. 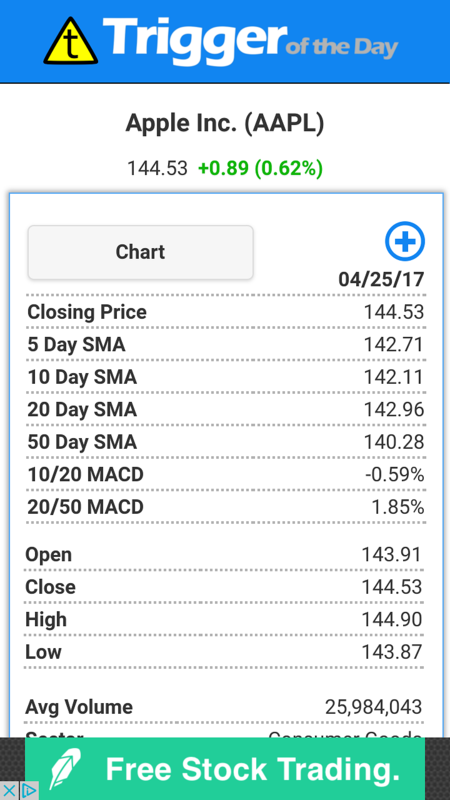 You may select "Up" or "Down" and points will be awarded based on the movement of that stock during the next trading day. Only the price action on the first day is considered for score-keeping. Correct responses will earn you 5 points and you will lose 3 points for incorrect responses. Every trading day you may play a challenge for each of our trigger alerts. Swipe left for "Down", right for "Up", or down to "Skip." You may only skip each stock once. Points will be awarded based on the movement of that stock during the next trading day. Only the price action on the first day is considered for score-keeping. Correct responses will earn you 5 points and you will lose 3 points for incorrect responses. 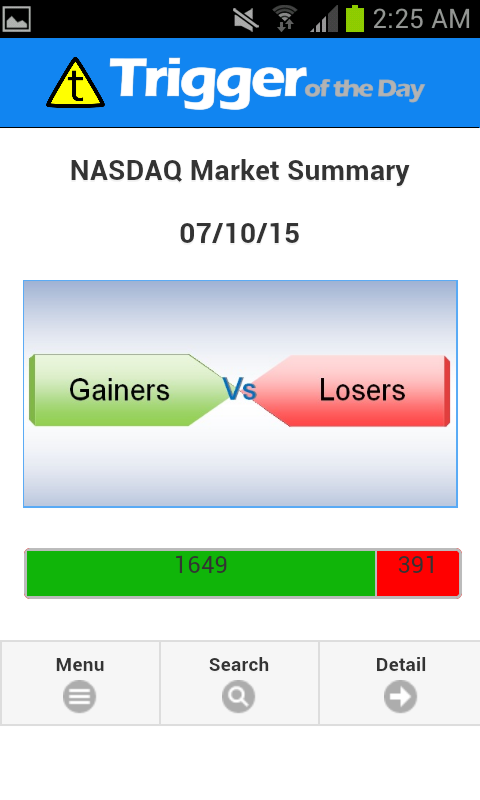 The number of gainers versus losers for the day in a quick graphic representation. The stocks we analyze are traded on the NASDAQ exchange with very few exceptions. A more detailed break-down of the movement of the market. Top 5 gainers and top 5 losers of the day. Stocks that traded at unusually high volume relative to their average volume. The average volume for a stock must meet a certain threshold to be included in this list. The high-level summary representing the number and category of the simple moving average (SMA) crossovers we identified. The list of bearish and bullish top picks for the next trading day. This is based on mathematics, technical analysis, and machine-learning. Please do your own due diligence before trading. After-hours news often affects stock prices and is not considered in these calculations. See how our previous top picks performed in most recent trading period. Please note that the top picks are meant to identify trends of all horizons. A list of the stocks we analyzed for which the 10 day SMA and 20 day SMA crossed or the 20 day SMA and 50 day SMA crossed. These include both bearish and bullish indicators. 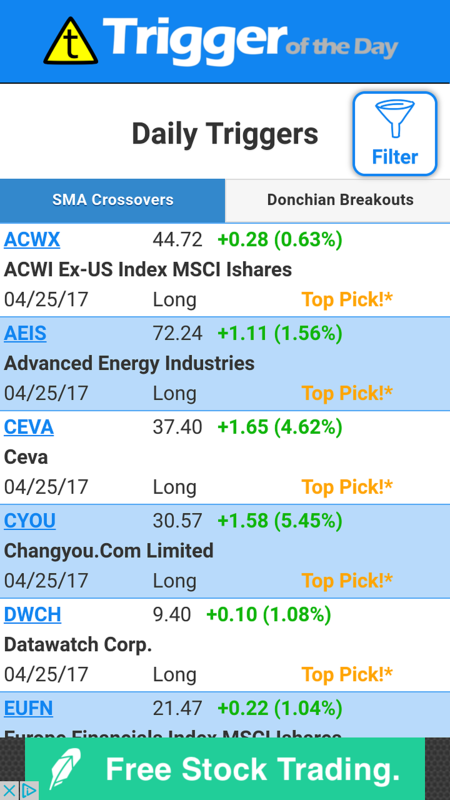 A list of the stocks we analyzed for which the closing price indicated an entry or exit trigger based on the Donchian Channel. 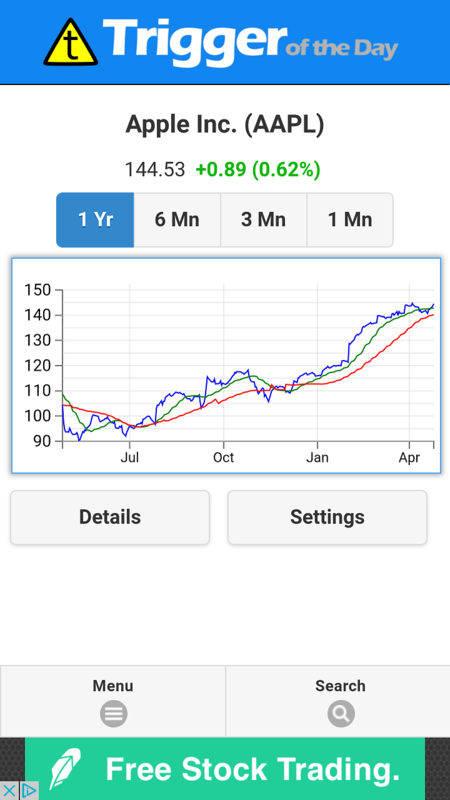 Find detailed information on any stock we analyze. Enter three or more letters for auto-complete assistance. If you attempt to drill down on a stock we do not analyze, you will be returned to the search page. Click the "+" on a stock's detail pages to add it to your Watchlist. You'll see the latest close price, price change, position indicated, and the date of the most recent trigger alert. The pivot point, support, and resistance levels calculated for the specified trading day. The pivot point, support, and resistance levels calculated for the specified week. The pivot point, support, and resistance levels calculated for the specified month. Plug in the high, low, and close for any stock we do not analyze. When you tap "Calculate" the pivot point, support and resistance levels are displayed. Here we explain the meaning of some of the terms used in our analysis. Your feedback is very important to us. We want to release updates to this application that will have the most positive impact on your experience. Please take the time to let us know how the application should evolve. Top picks are based on our proprietary methodology. Nothing on this site should be construed as financial advice. Assess the risks with your financial adviser before trading securities. We may or may not hold long or short positions in any or all of the securities listed. The information provided is meant to be as accurate as possible. Please double check any and all information before making your investment decisions.